From a macro perspective, the biggest risk to Tesla is the auto cycle. Tesla has a high bar given the lofty valuation relative to other automakers in the middle of a challenging period in the auto cycle. Accounting issues aside, Tesla may miss numbers or sustain the same problems that plague all automakers - a cyclical business. High valuations in a cyclical business typically do not end well. Without debating bankruptcy or the more aggressive calls on Tesla, the high flying car company may have serious downside during the backside of the auto cycle. As a macroeconomic analyst focused on inflection points in the economic cycle, it is not often that I dive into individual companies, especially ones as hotly debated as Tesla (TSLA). As the economic cycle matures and the evidence behind the deceleration in growth becomes more clear, the auto industry and the auto cycle continues to be a stand out in regards to one focal point of this slowdown. The auto industry is a highly cyclical business subject to the economic concept of exhausted pent-up demand. Once a consumer has one car or two cars, the demand curve falls off sharply. After a decade of pulling demand forward through various policies including zero interest rate auto loans, extended maturity financing options, cash for clunkers, several natural disasters that wiped out auto inventory and more, demand has been thoroughly exhausted in this industry and we can identify this in the data. Despite some of the more wild bullish arguments, Tesla is a car company because they produce and sell cars. I am a macro analyst and will not engage in the debate over Tesla's accounting practices or the possibility of bankruptcy, parking lots full of cars or anything else that has been thoroughly covered by the Tesla skeptics and firmly denied by the Tesla bulls. In this note, I want to take a look at what I believe to be the biggest risk to Tesla, or any auto-related company for that matter - the auto cycle. The auto cycle truly peaked in 2015 but had an artificial pop after hurricane Harvey in 2017. The stock price of Tesla has been flat since 2014 which is not unique to auto-related companies. Tesla has a high valuation, even most of the bullish investors would agree to that point. The problem is that high valuations in a cyclical business typically do not end well, most specifically when that business is on the back side of the sine curve as the auto sector is today. 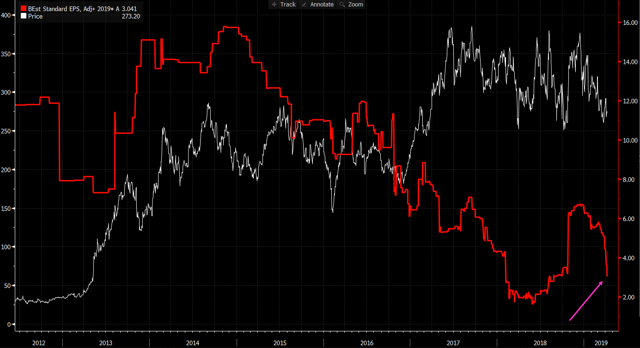 Whether we look at car companies or semiconductors, price to earnings ratios swing wildly into the double digits when times are good and become value traps with single-digit earnings ratios when the cycle turns. The earnings expectations at Tesla, at the risk of sounding too bearish, are collapsing as I will illustrate in the last section of this note. In terms of structure, we will take a look at the auto sector to demonstrate the lack of growth or negative growth that is plaguing the industry, the valuations in a cyclical business and lastly, whether or not the Street is starting to give up on Tesla in regards to earnings. All of the analysis will be through the context of the auto cycle as opposed to a more direct issue with Tesla as a company. The equity value at Tesla becomes an issue because it is the only car company to enter the backside of this cycle with a stratospheric valuation. As mentioned in the opening, the auto cycle is one of the more classic cyclical industries. The auto business is highly capital intensive, expensive in terms of the consumer spending basket, sensitive to interest rates as many purchases are executed with financing and subject to exhausted pent-up demand. As demand for new vehicles is exhausted, auto sales start to decline and the capital intensive industry has to pull back. The chart below shows US auto sales. The growth rate stalled in 2015 and has been trending lower over the better part of the last three years. Flat growth or negative growth is not the main concern with this analysis, more so that we have seen the peak rate of growth in the auto industry for this cycle. Peak growth rates carry peak valuation multiples and when growth rates slow or go negative, valuations compress. The decline or flat-line in auto sales is not a cyclical phenomenon that is localized to the United States. Auto sales in China are falling sharply and down double digits year over year. If the new growth prospects for Tesla are to expand into China, they are likely to run into the same auto cycle that is unfolding in the US and Europe. At EPB Macro Research, I have a measure of pent-up demand that takes an aggregated basket of housing sales, auto sales and big-ticket durable goods consumption such as home appliances. These three categories are large line items in the consumer basket, sensitive to interest rate financing and subject to exhausted demand as you typically do not need to purchase several homes or five washing machines. Below is the same measure as above but graphed in year over year growth rate terms. 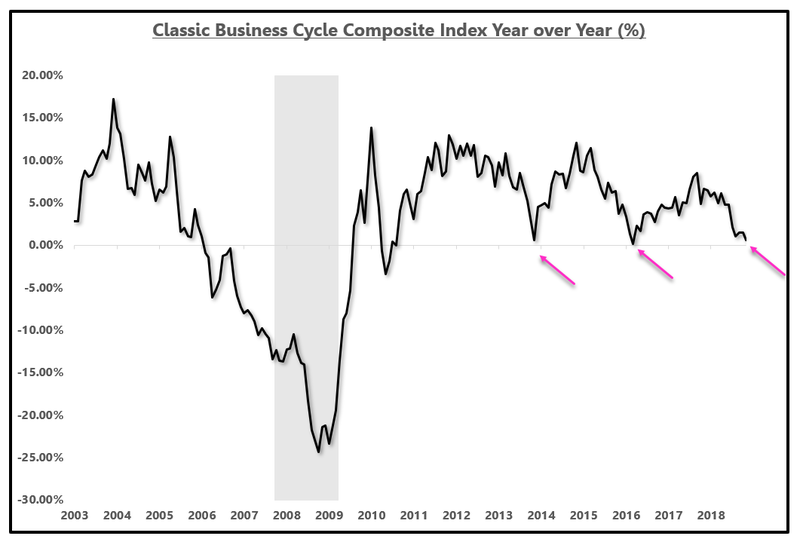 As the chart shows, the business cycle has been challenged three times since 2009, none of which resulted in a recession but all that raised recession fears, stock market corrections and compressions in valuation. We are in the middle of the third slowdown this economic cycle and the slowdown is heavily concentrated in the auto sector which is why most auto-related equities have seen no appreciation since 2015. To further emphasize this point, we can see the rate of auto-delinquencies rising which further supports the idea that the auto cycle and perhaps the larger economic cycle is slowing. If we keep in mind that Tesla is a car company, will it be possible to maintain the highest valuation this industry has ever seen while the auto cycle is deteriorating at an accelerating pace? 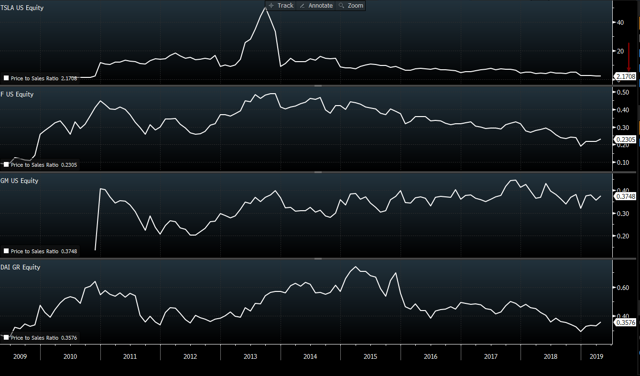 Now that at the very least we should all agree that the auto industry is more challenged today than likely at any other point since 2009, we can have a look at the valuation that Tesla is carrying into this cyclical downturn in autos. Below I compare Tesla's valuation to three other prominent automakers, all of which are also in the business of electric cars and autonomous driving. 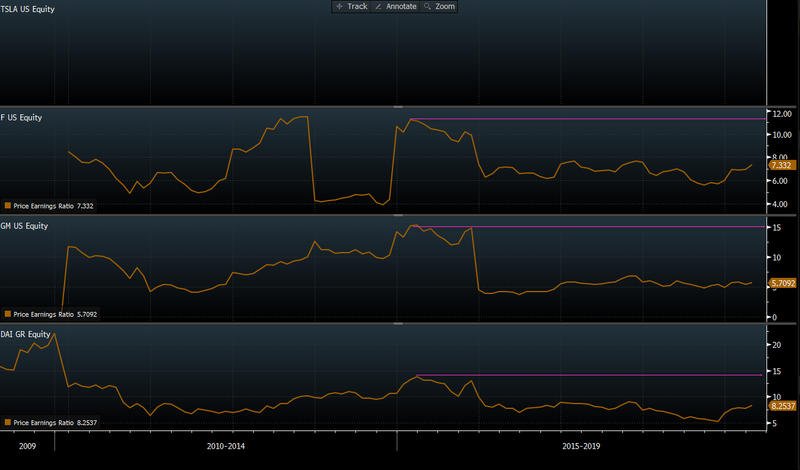 Given that Tesla does not have a history of earnings, we can look at the valuation relative to sales. Ford (F), General Motors (GM) and Daimler all trade in a band of 0.2 - 0.4 times revenue. Tesla carries a valuation almost ten times as aggressive at 2.17 times sales. Given that the auto industry is a cyclical business, I mentioned that the highest multiple comes at the peak rate of growth which for autos was in 2014-2015. 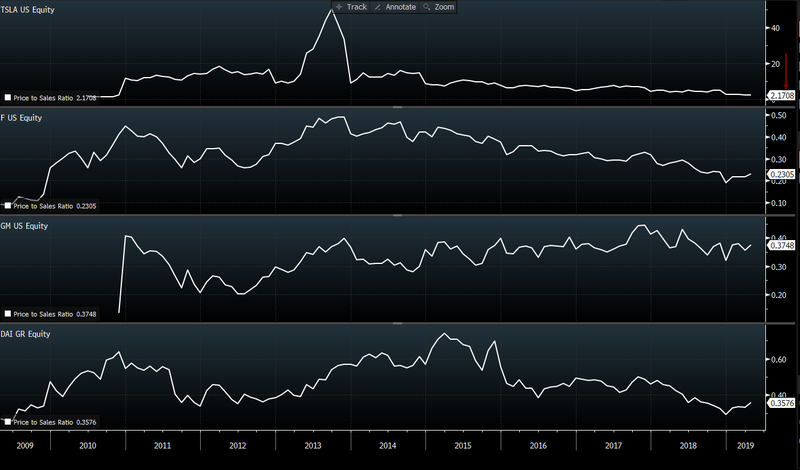 If we look at the price to earnings ratio of the major car producers, we can clearly see peak multiples coming at the point of peak auto sales growth. Some may find the auto companies "cheap" at single-digit earnings ratios but it is not uncommon for valuations to move this low in a cyclical business. 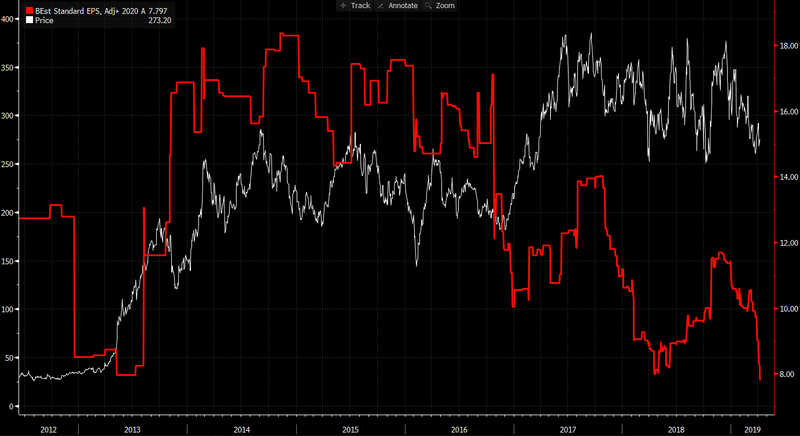 Just to bring in Intel (INTC) for honorable mention, semiconductors, another highly cyclical business shows the same valuation profile. Valuations move higher during periods of accelerating growth and as low as single-digits during the backside of the semiconductor cycle. 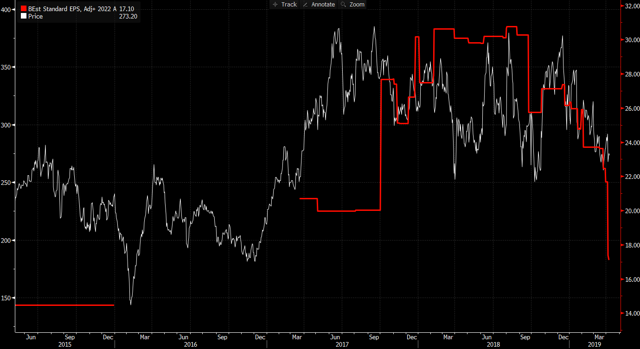 Given what we now know about the auto cycle, while Tesla has maintained a high valuation, the equity has not appreciated since 2014 which is surprising in some regard but not an uncommon trend in the auto sector because after all, Tesla sells cars. General Motors has seen no appreciation in the equity value since 2014, quite similar to Tesla. The good news for investors in General Motors is that you have been able to extract an income stream in the form of a dividend in lieu of the four years without capital appreciation. Tesla investors have not been paid to wait. If we turn to Ford, a similar story emerges. There has been no equity appreciation since the turn of the auto cycle but there has been a dividend for those who have been willing to remain invested. 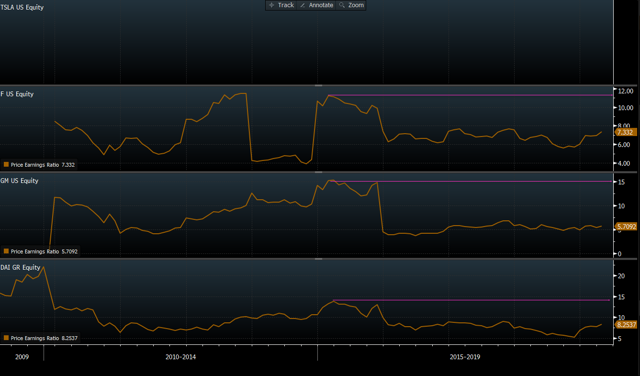 Lastly, Daimler, the German automaker does not buck the trend. When the auto cycle turns, it is very difficult for capital intensive automakers to generate significant returns. Investors understand the growth profile of a cyclical business and no growth carries a low valuation. While Tesla may have a different ring to it relative to other automakers, and certainly a different valuation, the appreciation in the equity, or lack thereof, is oddly similar to its peers. Tesla has never been challenged with the back side of the auto cycle and the equity holders are starting to realize that high valuations in a cyclical business are not profitable investments at best and dangerous at worst. The Street is sufficiently aware that the auto cycle has turned and given that Tesla does in fact need to sell cars, earnings estimates have been collapsing, to put it mildly. Is The Street Giving Up On Tesla? Below we will look at the earnings estimates for Tesla starting in 2019 and ending in 2022. Back in 2014, the Street though that Tesla would earn nearly $16 per share in 2019. Today, the Street is more comfortable at $3. 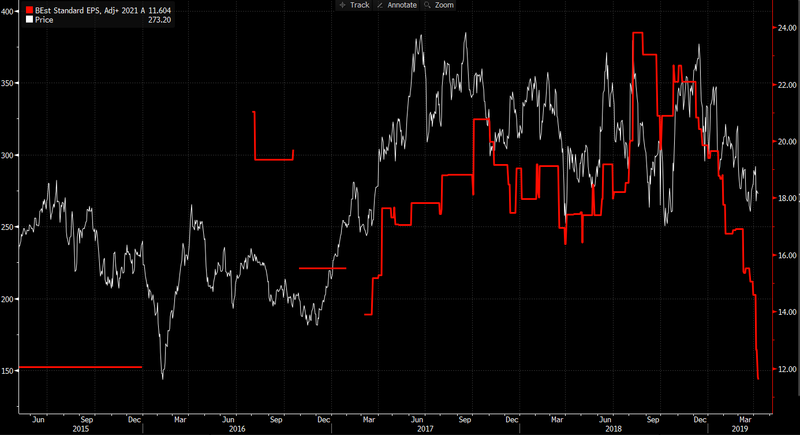 To reiterate, I am not making an argument about the balance sheet or the accounting but rather the auto cycle. Given what we should all know about the auto cycle, reductions in the earnings profile should not come as a surprise. This is highly consistent with cyclical businesses which is why the biggest risk to Tesla is quite simply the auto cycle. Moving out to 2020, EPS estimates have dropped from $18 per share to roughly $8 per share in the latest downward revision with the declines in estimates starting to accelerate in recent weeks. As we move out to 2021 and 2022, the decline in EPS estimates gets more "plunge-like" with expectations for earnings declining from $23 per share to $12 in a matter of months. Another 50% cut in EPS expectations can be seen in the 2022 estimates. The backside of the auto cycle and rapid EPS reductions have led to an equity value that has not appreciated since 2014. I am not making the argument against Tesla as a revolutionary technology or an argument for or against their accounting practices. This note simply highlights the fact that Tesla is carrying a valuation that is over ten times higher than traditional automakers as we enter the backside of the auto cycle. Tesla carries a valuation that is ten times higher than traditional automakers. Even if the valuation of Tesla fell by 50%, it would still be trading at 1x sales and five times higher than that of Ford. Famous short seller Jim Chanos has made cogent arguments against the accounting practices and their affinity to raise capital which should be of concern. I will leave those arguments to Mr. Chanos. I will not even step into the arena of making a terminal call on the equity value of Tesla but rather point of the risk of holding an equity that carries a valuation ten times that of its peers into the back side of one of the most cyclical businesses we know. At the end of the day, Tesla needs to produce and sell cars. The challenges that Tesla faces go behind those that are internal. Tesla has the burden of navigating a downturn in the auto cycle while maintaining a growth rate that is supportive of a sky-high valuation. The biggest risk to the equity value at Tesla is quite simply the auto cycle. A 50% decline in the multiple, and thus the stock price, would still leave Tesla valued much higher than traditional automakers assuming the trajectory of earnings estimates either stops or reverses. Tesla is a car company that needs to battle the auto cycle. Time will tell if they are able to navigate this highly cyclical business. How Can You Spot Economic Inflection Points? 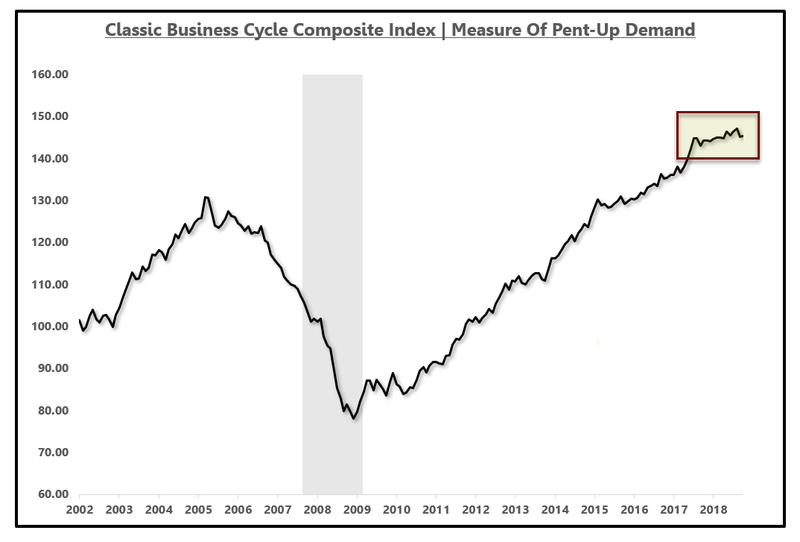 EPB Macro Research uses composite leading indicators, such as the business cycle indicator, and a wide range of economic data to properly prepare for inflection points in the economic cycle.